This would be the best platform for you to target commuters and mobile users using public transportation. The most common profile of consumers would be students and working adults around the 15 to 35 years of age. The KL Monorail circles around the heart of Kuala Lumpur which is made up of 11 stations. When you do this, your ad will be seen across the entire body of the train. The train sponsorship is the medium of choice to target motorists and commuters throughout the city. With a large surface body area, advertisers have a bigger display. Inside, lighted overhead panels and other display panels target the captive audience of commuters. Advertising in transportation modes like Putra LRT is very effective if you are targeting urban consumers and the young adult market. This is because your ads will be travelling to extremely high traffic areas and locations around the Klang Valley where the Putra LRT Kelana Jaya line covers a large area in Petaling Jaya and Bangsar. If you want to be loud to impose a strong message across your target audience, you can go for station branding like Titiwangsa, Sentral and Hang Tuah Station. This is a costlier option which will involve a full range of different areas of the station that can give your brand a strong image and awareness among your audience. Platform: Escalator Graphics, Stairs Graphics, Stickers on Sliding Door and on platform doors. Your ad will cover an entire train which will include both the external and internal parts of the train. This is highly impactful as your ads can be seen by people outside as well as by the commuters. A majority of commuters taking the Putra LRT are known to spend most of their time standing while a lot prefer to do so because of the short trips between stations. 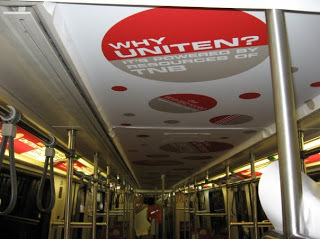 As such, your ads on the In-Train overhead panels can be clearly seen. These are ads that are placed on the side of the train’s interior usually beside the door and between coaches. Very captivating for commuters who are standing as they spend an average of 14 to 17 minutes in every ride. A highly unique OOH media available only in trains. As mentioned, commuters on the Kelana Jaya line are more prone to standing and holding to the Hand Grips. Your ad can be seen each time they take the train. Your ads can be attached to the window of the train which can be seen from both inside and outside the vehicle. This media can be very effective as it is exposed throughout the journey of the commuter. This is a highly effective media if you have an integrated marketing campaign which you can incorporate with other related media in the train and stations. The Ambient Arch available is 8ft high. If you have a specific campaign or promotion that use a certain ambient, you can use this media where you can customise your message accordingly. You can customise your ads to be attached to the benches which is very impactful as they appeal very much to the commuters, particularly young adults and college students. This is because, commuters spend an average of 5 minutes waiting for the trains at every station. Placed at the stations, you can advertise on the vertical lightboxes available. This refers to the lightbox advertisement which comes with audio. Basically, your ad has visuals as per the usual ads but the voice within the box will attract more attention thereby drawing more impressions for your ad. Bulkheads are located at prominent locations within the train and are usually placed at perfect eye-levels which means that your ads will be highly visible and effective as commuters will be able to see it throughout the duration of their trip. Measuring at 5ft x 10ft, this media can be very effective especially if you are targeting commuters who are waiting at the station for their trains to arrive. Basically, it can be seen if the train has yet to arrive which is an average of 5 to 8 minutes every stop. Like Adtracks, this media is very useful if you are targeting consumers at the train station.